Wisdom of Life. : My heart grows fonder. Today I had a chance to meet up with a good old friend, Johnny Leong who is at 70 and still working actively as a real estate agent. He looks healthy and youthful for his age, and equally he could see my eyes are sparkling with plenty of love. He shared this meaningful proverb... "Familiarity breeds contempt. 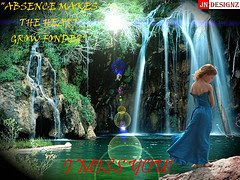 Absence makes the heart grows fonder". As good friends we did not meet often but when we met now, we had a lot to share and talk. Our hearts were excited and our mind felt so wonderful to be together again. From here he moved over to 'romance and love'. Surprised me for a man of 70! To fall in love is easy but to maintain and hold a love relationship is difficult. All loves begin with desire when couples want to be together. A day unseen, a day untouched or a day unspoken would definitely make lovers uneasy and unhappy. However the day comes when both couples know so much of each other, situation and emotion might change. That's the meaning of 'Familiarity Breeds Contempt'. The funny part of life is, when both couples are separated or absence for awhile, their 'heart grows fonder' to each other more. Perhaps Johnny's words were right...I had not seen and spoken with my little darling for the whole day, my heart really fonder over her. What about you? Exactly, some people need even more space and is not suitable for a relationship. I am glad you came back again. Thank you for your comment. Thank you for reading my blog. Tell me...what you like and don't like out of my writing. Your comments would be most appreciated.